Just as Spidey is swinging back into theaters for, doubtless, another big opening at the box office, The People’s Critic is just getting a chance to write up the Spring’s first big blockbuster. That’s right, Cap is back, and in a big, big way! Remember when Sam Raimi’s Spiderman came out, and everyone was saying, “Now that is how you make a comic book movie!”? But then The Dark Knight came out and everyone said, “No wait, now that is how you make a comic book movie!” Taking nothing away from Spiderman, The Dark Knight, or the other entries in the Marvel franchise, I would like to formally invite Captain America: The Winter Soldier into the conversation because this is how you make a comic book movie! To begin with, Captain America: The Winter Soldier is a terrific political conspiracy thriller in the style of Three Days of the Condor or The Parallax View except with superheroes and a bigger budget. I can honestly say that anyone can enjoy this film even without previous knowledge of other Marvel franchise films. I can say this because I took my mother to the film and she loved it. For those of you who know my mother’s skepticism to all things “comic,” that should send you to the theater immediately. For those of you who don’t know my mother or need even more motivation, now I’m speaking to you. Captain America: The Winter Soldier is the follow-up to Joe Johnston’s 2011 film, Captain America: The First Avenger. The sequel, exquisitely directed by Anthony and Joe Russo, finds “Cap” Steve Rogers (Chris Evans) finally adjusting to life in the 21st century. Still an active member of S.H.I.E.L.D, Rogers continues to take missions but is finding modern ethics a bit distasteful compared to those he lived by in the 1940s. When S.H.I.E.L.D. director Nick Fury (Samuel L. Jackson), reveals a new initiative called Project Insight, Rogers has major doubts. Spearheaded by the World Security Council, Project Insight would use triangulated helicarriers that track bio-levels in all humans to determine future threats and then eliminate them before they can ever strike. Similar to the conflicts in the film Minority Report, this form of “pre-crime” judgment is a tough pill for Rogers to swallow. After Fury requests that Secretary of Defense Alexander Pierce (Robert Redford) delay Project Insight, Fury is suddenly attacked in one of the finest action sequences put to film in recent memory. Now Rogers along with new pal, Sam Wilson (Anthony Mackie) and Agent Natasha Romanoff (Scarlet Johansson), must search to find who it is that is attacking S.H.I.E.L.D. and preserve the safety of America and the world. His efforts are complicated with the arrival of The Winter Soldier, a mysterious super soldier with talents and abilities rivaling those of Rogers’s. The cat’s mostly out of the bag regarding what the Winter Soldier’s identity truly is, but I will not reveal it here. Back to my original statement about why this film belongs in the conversation of finest comic book movies. While many films of this genre are born into intergalactic conflicts and absurdly fantastic plotlines, the best of them are grounded, at least partially, in reality. The motive for Captain America has always been protecting his homeland from threats, and it is a credit to the Russo brothers and writers Christopher Marcus and Stephen McFeely to put him in an environment where he is doing that very thing. Additionally, the performances are pitch perfect. 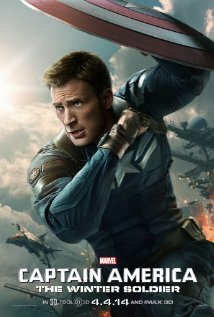 Evans brings the perfect balance of charm, bravado, and idealism to the role of Captain America, and Robert Redford puts forth a very real and noteworthy performance as Pierce, no doubt inspired by how Tommy Lee Jones treated his role as Colonel Phillips in Captain America: The First Avenger. Captain America: The Winter Soldier is rated PG-13 and has a running time of 2 hours and 15 minutes. Marvel continues its trend of providing stingers after the credits, so stay comfortable and enjoy two scenes – one midway through the credits and one afterwards.